Mark June 14 – 20 on your calendar. Clear your calendar so you can go fishing, fishing for ideas that is. 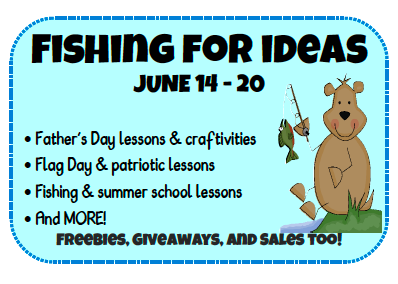 Some of my blogger friends and I are going to host a Fishing for Ideas extravaganza. You will be able to hop from blog to blog and get ideas for Father’s Day, Flag Day, patriotic lessons that could also be used for Veterans Day and Memorial Day, and summer themed activities. Mark June 14 – 20 on your calendars so you don’t miss out!